Every garden needs a killer Zombie Gnome to keep the nosey neighbors out. Designer Doug Hudson, has crafted an amazing pair of gnome zombies cast out of garden statuary stone created to deliver a Zombie Apocalypse any time of year. The hand painted Walking Dead gnome measures 14 inches tall and weighs 10 lbs. My personal fave is Doug's Rising Dead zombie gnome as depicted in his classic "Lawn of The Dead" poster. 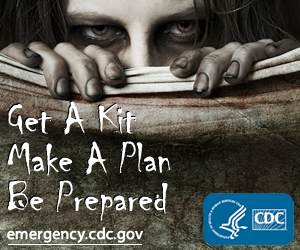 Expect to fork over $49 for the "Walking Dead" version and $39 for the early riser edition. This is must-have zombie art for the home and garden horror geek. 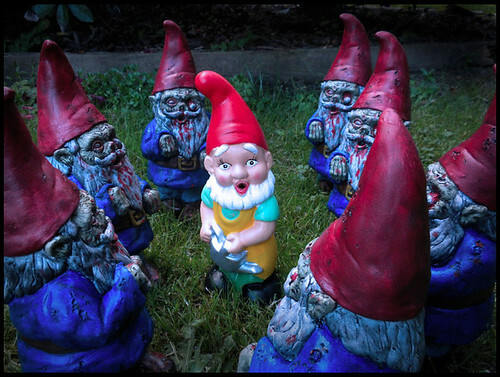 Zombie gnome flash mob? Killer coolness! Hahaha, that is so freaky! I don't think I'd be able to put those in my yard, though (I don't really do gnomes). What I would do, however, is switch a few of those with my neighbor's garden gnomes, one every day, and see how long it takes for him to notice! Well that defiantly would make for one unique garden! I just love breaking my garden wagon and getting to work. I think these would add a bit of fun to my beautiful work as well!